The observant among our readers will have noted that alongside the canonical representation of the Grand Prix Humanitaire de France et des Colonies that is part of the San Luigi Orders a further organisation exists in France that employs a similar name (Grand Prix Humanitaire de France) and claims the same foundation. This paper will explain how this situation has come about. 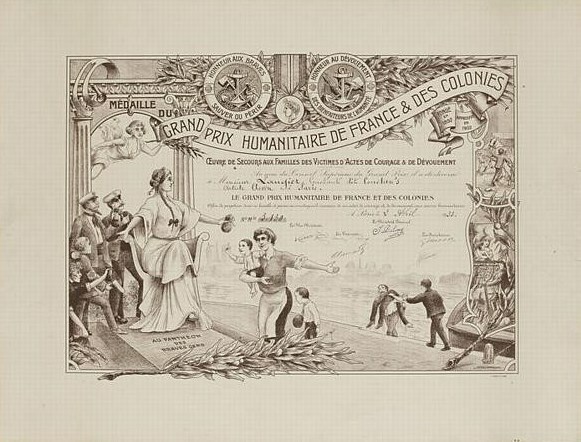 On 18 September 1892 in Paris, Charles Leroy established the Grand Prix Humanitaire de France et des Colonies as an endeavour of aid towards the families of victims and to reward acts of courage and devotion. There was an especial dedication towards such acts at sea, and a further direction was towards the recognition of those whose acts had been of benefit to humanity. It was to be this last category that would predominate in the history of the award. Leroy resigned almost immediately as the first President of the Grand Prix and was succeeded by Louis Druel. Druel, who died in 1933, was highly active in the chivalric and fraternal societies of the day, and his photographic portrait shows him wearing well over thirty miniature medals, in addition to the sash of a Grand Cross (possibly of the Order of the Crown of Thorns, though without the benefit of colour it is not possible to establish this beyond doubt), three breast stars and an array of neck decorations. He was president of “la Voltairienne fanfare [band] de XIo arondissement” – a society founded in 1885 whose handsome decoration is almost identical in design to the first “Marianne” rescension of the Grand Prix used after 1902 – and of the “defense aérienne”. It is not difficult to discern the considerable patriotism that attended the Grand Prix Humanitaire. 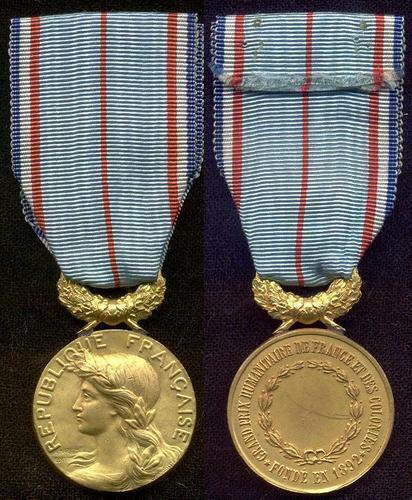 The ribbon for the medal incorporates the tricolor, and on the obverse of the post-1902 “Marianne” design we see the bust of Marianne together with the proud legend “Republique Française”. In the early years of the Grand Prix Humanitaire the person of Louis-François de Girardot (1869-1959) becomes evident. 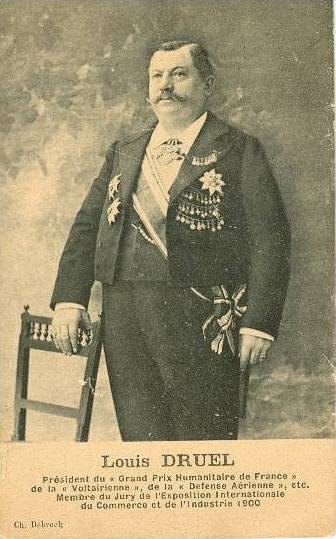 We know de Girardot, of course, as the fifth Prince-Abbot of San Luigi, to which office he was appointed by his predecessor on 25 August 1896 with the appointment becoming effective on 5 May 1897, this being legalized before the Mayor of the Commune of Seine-Port (Île-de-France), M. Eugène Clairet (who served as mayor from May 1896 to May 1900) and two witnesses. Girardot seems to have been as extensively involved in the chivalric and societal world of Paris as was Druel. As of the late 1890s, Archbishop Joseph-René Vilatte (1854-1929) was already a well-known figure in Paris, having been consecrated in 1892 by the Syrian Orthodox Church, not as a Syrian Orthodox bishop, but as the first metropolitan of the Old Catholic Church in America. There were several Old Catholic churches in France, and since 1893 he had been the head of one of these, the Eglise Catholique Gallicane. In 1899, Archbishop Vilatte resided for a time at the Benedictine Abbaye Saint Martin de Ligugé at Poitou near Poitiers. Here he met the author Joris-Karl Huysmans, whose most famous work is “A Rebours” (Against Nature) and who was a major instigator of the Decadent movement in literature that continues to exert an influence to this day. In addition, Archbishop Vilatte was introduced to Prince-Abbot Louis-François by Dom Jean Parisot, one of the monks. Dom Jean, who in 1896-97 had been dispatched by the French Ministère de l’Instruction Publique to research the Syriac language and to transcribe the music of the Syrians, Maronites and Chaldeans, would go on to write one of the first biographical studies of Archbishop Vilatte in 1898. It seems most likely that discussion between Prince-Abbot Louis-François and Archbishop Vilatte concerning a possible collaboration was productive because both at this point headed separate Orders of the Crown of Thorns; in the case of Prince-Abbot Louis-François, that which had been founded by the first Prince-Abbot of San Luigi on 15 October 1883, and in the case of Archbishop Vilatte, that which was re-established by the Syrian Orthodox Patriarch on 1 June 1891, the two orders having continued oblivious of each other’s existence until they had both come to be headed by Frenchmen from 1897 onwards. It was logical for these authorities to be combined under a single administration rather than to risk continued confusion, and accordingly on 7 May 1899, in a ceremony before M. Clairet, the Mayor of Seine-Port, Prince-Abbot Louis-François transferred to Archbishop Vilatte the Abbey-Principality of San Luigi with the attendant Grand Mastership of the 1883 Order of the Crown of Thorns and of the Order of the Lion and the Black Cross. Archbishop Vilatte duly took office as the sixth Prince-Abbot with the regnal name Joseph III. In including the Grand Prix Humanitaire in this transfer, M. Druel, its then-president, and Prince-Abbot Louis-François may well have taken the view that its aims of the recognition of humanitarian service were in truth more suited to a religious setting than a secular, particularly since Archbishop Vilatte represented an Old Catholic viewpoint that was intimately connected with that of the Holy See and whose separation from Rome was seen by many as a temporary measure that could be alleviated by a more sympathetic pontiff than Pius IX. Indeed, once the transfer of authorities had been agreed with Prince-Abbot Louis-François, Archbishop Vilatte had entered a petition to the Holy See on 12 February 1899 requesting that he be recognized in his new office as Prince-Abbot and thus permitted to reconcile with Rome in good standing as a bishop. He had established a residence in Paris at 199, Boulevard Pereire, which he renamed “San Luigi House”, and was formally installed there as Grand Master of the Order of the Lion and the Black Cross in 1900. During the Exposition Universelle in the same year, San Luigi House provided hospitality and services for visitors to Paris, some of whom later became members of the San Luigi Orders. Druel was a member of the jury of the Exposition. The response of the Holy See to the petition of Prince-Abbot Joseph III was not the positive answer which had been expected, with Pope Leo XIII instead excommunicating him on 13 June 1900. The Prince-Abbot had probably not helped his cause by continuing his active ministry during the consideration of the petition, including consecrating an excommunicated Roman Catholic priest as a bishop for the Italian National Episcopal Church on 6 May. It seems that this development caused some difficulty among some elements that had hitherto supported him, and an opposing faction began to form which resulted in vitriolic and largely baseless attacks being published in the Roman Catholic press. Meanwhile, Prince-Abbot Joseph III, an inveterate traveller, left San Luigi House in 1901 to visit his missions in the United States, and would not return to Paris for some time. During the nineteenth-century, the official position of the French state towards private associations, particularly those set up to provide assistance to others, was one of distrust and general disapproval. Article 291 of the 1810 Penal Code made it an offence for any society of more than twenty people to be formed with the aim of regular meetings without first obtaining the permission of the government, although subsequent changes weakened this stance. Eventually, this situation was to change radically under the Third Republic. The law introduced by Waldeck-Rousseau in July 1901 allowed non-profit associations to register for the first time and enjoy legal standing in their own right. There was no obligation to register; an unincorporated association (association de fait) was one of the three types of association recognized under the law of 1901. Initially, this was the form maintained by the Grand Prix Humanitaire. However, during 1902, a group of those who had been involved with the Grand Prix Humanitaire decided to form a registered association under the law of 1901, and this was carried out at the Paris Préfecture of Police with association number 150,292. This action seems to have marked a separation between the party of Druel and Girardot, which was responsible for the registration, and that of Prince-Abbot Joseph III. In consequence two separate entities were now established, both initially bearing the same name and claiming the same foundation; the original unincorporated association headed by Prince-Abbot Joseph III, and the new registered association of 1902 which elected Druel as its president. One point to note is that whereas the Grand Prix under San Luigi has maintained its original name of “Grande Prix Humanitaire de France et des Colonies” to the present day, the 1902 association has generally dropped the “Colonies” from its later documents. 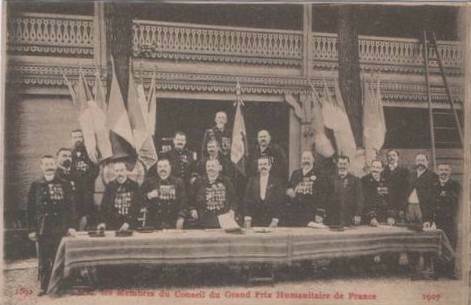 It is possible that these events responded in part to the fact that Prince-Abbot Joseph III was absent from France for extended periods after 1901; it is even possible that some measure of administration was being undertaken by others with his consent; however in the 1907 photograph of the council of the 1902 association he is nowhere to be seen, although as will be related he was in France at the time. What is clear nevertheless is that Prince-Abbot Joseph III continued to award the Grand Prix Humanitaire in the intervening years as was his right; prominent recipients at his hands included the contralto Ernestine Schumann-Heink, the organist Paul Carson and the obstetrician Allan Roy Dafoe, each of whom also received the Order of the Lion and the Black Cross. Postcard showing the Council of the 1902 Association of the Grand Prix Humanitaire, 1907, under the presidency of M. Druel (front row, fourth from left). M. Girardot is also presumably present. A detailed account of Prince-Abbot Joseph III’s church work in France in the latter years of the same decade should now be given. In 1906, Prince-Abbot Joseph III returned to Paris, where he was involved in a project called the Associations Cultuelles Catholiques. This was led by Henri Durand-Morimbau and some senior freemasons in the French government, notably Aristide Briand (1862-1932) (who would become Prime Minister of France in 1909), who sought to create an alternative to the national Eglise Catholique Française. This alternative was the Eglise Catholique, Apostolique et Française, of which Prince-Abbot Joseph III was elected Archbishop-Primate. In its turn, this body was a revival of the Eglise Catholique Française, which was founded on 15 January 1831 by the Revd François-Ferdinand Toussaint Châtel (1795-1857) (who became the Primate) and Bishop Thomas-Juste Poullard (1754-1833), both of the Eglise Constitutionnelle. This body was close to the original Unitarianism in its beliefs. In 1843, the church was forcibly closed by the police. Châtel revived it as the Eglise Française Radicale in 1848, only for it to be closed by the police again in 1850. The 1801 Concordat had caused a breach between France and Rome, and in 1905 the separation of church and state was enacted by the Law of Separation. On 11 February 1906 Pope Pius X denounced the Law of Separation and his encyclical Gravissimo prohibited any compromise. In response, Durand-Morimbau initiated the Ligue des Catholiques de France (a fellowship of around 200 Old Catholic groups) with a Sécretariat des Associations Cultuelles Catholiques in Paris, led by Abbé Félix Meillon, which founded the Eglise Catholique, Apostolique et Française and invited Prince-Abbot Joseph III to be its Archbishop-Primate. At once many priests joined the church, including Frs Darragon, Duhamel, Roussin, Ruelle, and Sterlin. After the restoration the church came to include the Eglise Catholique Gallicane, of which Prince-Abbot Joseph III was also appointed Archbishop-Primate while in France in 1907. The Eglise Catholique Gallicane had been founded in 1878 by the Revd. Hyacinthe Loyson (1827-1912), a married priest who established Old Catholicism in France. He first met Prince-Abbot Joseph III in the autumn of 1883 while the future Prince-Abbot was studying divinity at St Saviour’s College in Canada. The church was under the nominal leadership of Anglican bishops from its outset. From 1879-82 it was under Robert Eden, Primus of the Scottish Episcopal Church, and then from 1883-87 under Henry Lascelles Jenner, formerly Bishop of Dunedin of the Anglican Church in New Zealand. Lastly, from 1888-93, it was under Arthur Cleveland Coxe, Bishop of Western New York of the Protestant Episcopal Church, who was a notable defender of Prince-Abbot Joseph III against the attacks of other Anglican bishops. On 3 March 1893, Loyson resigned from the church, at which point it split into two sections. One section united with the Eglise Catholique Française, while the other remained independent and broadly Old Catholic in alignment. It was this latter section that the future Prince-Abbot Joseph III now led, and it was joined soon afterwards by the Revd. Paul Fatôme and his parishes in Corrèze, Saint-Cyr la Roche and Beyssac. The parishes of Persan (Seine-et-Oise) were incorporated in June. Prince-Abbot Joseph III absorbed the Eglise Catholique, Apostolique et Française into the Eglise Catholique Gallicane, thus creating a single body under his leadership. On 3 February 1907 he dedicated a new church at 22 bis de la rue Legendre, which today is called Saint-Charles-de-Monceau and is a Roman Catholic parish. The service was disrupted by militant Catholics, who demonstrated against the Gallicans and, but for the presence of the police, would have caused a riot. Trouble began when Fr. Roussin, who was preaching the sermon, welcomed the approach of Catholic independence and looked forward to the day when “all the churches of Jesus Christ will unite in Christian charity”. He then thanked Prince-Abbot Joseph III for establishing the church, and at this the congregation descended into general tumult, and about fifty people were expelled from the church. Prince-Abbot Joseph III now appeared robed at the altar, and this was cause for a further outbreak of unrest. However, something of Prince-Abbot Joseph III’s character can be gained from the newspaper report of events, “Nevertheless he continued, saying he had been a missionary for thirty-six years, but no savage tribe had ever prevented him from speaking, and concluding, “Even to those who interrupt and revile me I say I will not excommunicate. I wish you no ill. God be with you. Amen.” The Mass then proceeded, but the Catholic demonstrators, instead of kneeling at the elevation of the Host, climbed onto their chairs. In 1912, Bishop Louis-Marie-François Giraud (1876-1951), who was ordained priest by Prince-Abbot Joseph III in 1907 and consecrated in his succession in 1911, became Primate of the Eglise Catholique Gallicane and Prelat-Commandeur of the Order of the Crown of Thorns, holding both offices until his retirement in 1950. 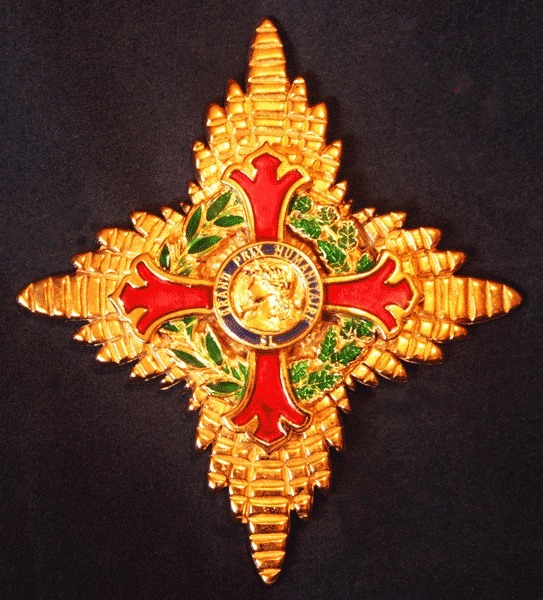 The 1922 History and Regulations of the Order of the Crown of Thorns says of the Grand Prix Humanitaire that it is “to reward those who relieve the poor in distress, who help the widow and the fatherless, to encourage virtue, frugality, the arts, industry and patriotism, without distinction as to nationality or creed.” (p. 4) In the same work are listed among the Patrons of the Order both Druel and Girardot, and it is noted that Druel held the additional distinction of Doctor Christianissimus bestowed by the Order. This provision may have been considered necessary because Prince-Abbot Joseph III’s choice of successor would be controversial in one particular regard. The patriotism and national character of the Grand Prix Humanitaire has already been noted, and notwithstanding his duties in the Americas, Prince-Abbot Joseph III had been born and would die a Frenchman. His successor, by contrast, was an expatriate Englishman, resident in the United States of America, and with no obvious French connexion. Not surprisingly, the French contingent did not take kindly to such a development. Nor indeed was Prince-Abbot Joseph III’s decision to reconcile with the Holy See in 1925 met with universal approval. Mgr. Giraud of the Eglise Catholique Gallicane had on 25 May 1924 sent a delegation of three deputies and a priest to invite the Prince-Abbot once again to become the primate of his church. The request left the Prince-Abbot perplexed; he felt that to accept was incompatible with his desire to reconcile with the Holy See, which matter was now under serious consideration, and as a result Mgr. Giraud took the negative decision as a great insult as well as deploring the reconciliation as a betrayal of principle. This left the Prince-Abbot without significant allies in the clergy so far as France was concerned, since his position in the Roman Catholic Church was always that of a quiet monastic retirement and was never concerned with the public exercise of office. His association with Patriarch Jean Bricaud of the Universal Gnostic Church was also unlikely to have won him many friends, since Bricaud had a reputation that was controversial to say the least. We should return to Druel and Girardot at this point. It seems that after the Abbey-Principality had been officially disposed of, their attention had shifted to the Kingdom of Araucania and Patagonia under its French king-in-exile, Aquiles I (Gustave Laviarde) (1841-1902), who was also the first Royal Patron of the Order of the Crown of Thorns. Girardot received the title of Baron from the king. In 1902 another Frenchman, Antoine-Hippolyte Cros (1833-1903) briefly succeeded Laviarde as Antoine II, and was then succeeded by his daughter, Laure-Thérèse Cros-Bernard (1856-1916) (Laure-Thérèse I) and her second son Jacques Alexandre Antoine Bernard (1880-1952) (Antoine III). The main body that provided support to the Kingdom-in-exile was the Ordre du Constellation du Sud, a chivalric order that metamorphosed into another French non-profit society, the Société des médaillés de la Constellation du Sud (after the death of Girardot renamed La Légion des Medaillés de la Constellation du Sud). The headship of the Société des médaillés was united with that of the 1902 foundation of the Grand Prix Humanitaire under Druel, who served as president until 1933, being succeeded by Isidore Louis Dulong (1933-45) and then by Girardot until 1955, when the joint headship was separated once more. It seems entirely likely that Girardot had a significant responsibility in connection with the transfer of the crown of Araucania and Patagonia from the childless Antoine III, who abdicated in 1951 in favour of Philippe Boiry (1927-2013) (Philippe I). Diploma awarded by the 1902 association in 1932 and bearing the signatures of Druel and Girardot; it seems likely that this was a modified design of the original engraved diploma that would have been awarded from 1892. When Prince-Abbot Edmond I succeeded to San Luigi in 1929, it appears that he found the French contingent entirely unwilling to accept his authority. Their allegiance, it would seem, had been transferred from San Luigi to Araucania and Patagonia, and so far as the Grand Prix Humanitaire was concerned, to the 1902 association. Indeed, Prince-Abbot Joseph III’s erstwhile secretary began to claim falsely that the 1899 transfer was never completed – a lie that was easily exposed as such both by his signature on several subsequently-issued brevets of the Abbey-Principality and by his unsuccessful attempt to have Prince-Abbot Edmond I recognize the title of nobility that he claimed had been conferred upon him by Prince-Abbot Joseph III! Rumours were also circulated that Prince-Abbot Joseph III had conferred titles upon unsuitable people and had generally brought San Luigi into disrepute. These rumours were without any credible foundation. Such behaviour, however, was evidence that the French had now turned against San Luigi as it was now constituted, and were determined to discredit that which they could not control. We should not overlook the possible influence here of Mgr. Giraud’s spurned church and moreover his masonic connections; Druel and Girardot were both freemasons as were many involved with the societies and chivalric orders. By contrast, although Prince-Abbot Edmond I was a member of the Craft, the character of San Luigi was not masonic and it had preserved an orthodox Old Catholic outlook throughout. A further matter of interest is the destination of documents and other properties at the death of Prince-Abbot Joseph III. A number of documents relating to the early years of San Luigi had previously been lost in a fire at the Prince-Abbot’s home, but what remained with him clearly still included items of interest. His nephew and heir, Georges Panchaud, wrote to Prince-Abbot Edmond I on 14 June 1930 recognizing his lawful succession and saying that in his view the Roman Catholic authorities had taken possession of all Prince-Abbot Joseph III’s documents at his death, when “even my sister could not enter the room, and a month after the death, the director of the Monastery remitted papers to Mrs Thénint my sister but these papers have not a bit of value.” It seems clear that Panchaud wished to create the impression some degree of seizure or suppression of significant documents had taken place. Furthermore, Mrs Thénint had previously informed Prince-Abbot Edmond I that the documents relating to the Order of the Crown of Thorns (and presumably to the Abbey-Principality) were in the possession of Druel, who according to Panchaud was also in possession of Prince-Abbot Joseph III’s seal. We should recall that Prince-Abbot Edmond I had seen these documents previously during the immediate post-war years, and so he was well aware of their existence and of the importance of what was to be found therein. The obvious question to ask would be what business Druel had with documents and articles that were clearly (as witness the notarized document of 1923) intended for Prince-Abbot Edmond I. An equally obvious answer would be that by gaining possession of them, and perhaps by suppressing or destroying them, he would strengthen any attack on San Luigi and shore up the position of his party. In the event, however, all this was mere smokescreen. The significant documents and artefacts were not in Druel’s possession at all, but had been smuggled out to Archbishop Lloyd in Chicago by Bricaud and his wife. Was Druel aware of this secret plan, or simply being named as a means of throwing enquirers off the scent? Unless the documents on the matter are made more widely available, we shall probably never know. It certainly appears that any attempt by Prince-Abbot Edmond I to enter into discussion with Druel proved fruitless, and our archives do not show that there has been any contact between the parties since then. In a publication made in his late eighties, Girardot went so far as to deny the existence of the Abbey-Principality and claim the entire episode had been a hoax; this again would appear to reveal his hostile agenda, since were such to have been the case, Girardot would have committed fraud twice over in his participation in the legalisation of the transfers of 1896-7 and 1899. Nevertheless, the award of the Grand Prix Humanitaire by Prince-Abbot Edmond I continued throughout the 1930s and has been maintained continuously ever since, amid the extensive growth of the San Luigi Orders during the post-war years and into the present day, with the most recent conferral occurring in December 2012. A Royal Patron was appointed for the Grand Prix Humanitaire by Prince-Abbot Edmond I in the person of H.H. Sir Sawai Man Singh II, the last Maharaja of Jaipur (1912-70). Within a short time of his accession, the San Luigi Orders found new representation in France, and there was an active membership there until at least the 1970s. 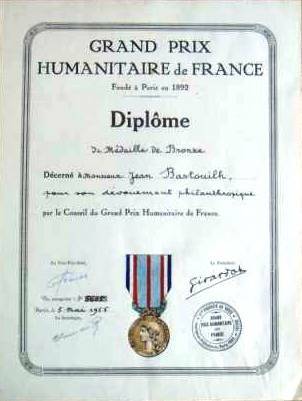 As of 1938 Prince-Abbot Edmond I reported that there were sixty-five living holders of the Grand Prix Humanitaire with a maximum of ten awards being permitted in any one year. Druel’s Grand Prix Humanitaire became rather active during the 1930s and has remained so ever since. Where the Grand Prix Humanitaire under the Abbey-Principality has made its awards very sparingly, with an annual limit on conferrals and in some cases with many years separating them, the 1902 association has, so we are told, conferred some 15,500 awards upon both the famous and the less famous – but with a discernable concentration on those who are French citizens. Diploma awarded by the 1902 association in 1955, with the signature of Girardot. Note the changed design and the omission of “et des Colonies”.